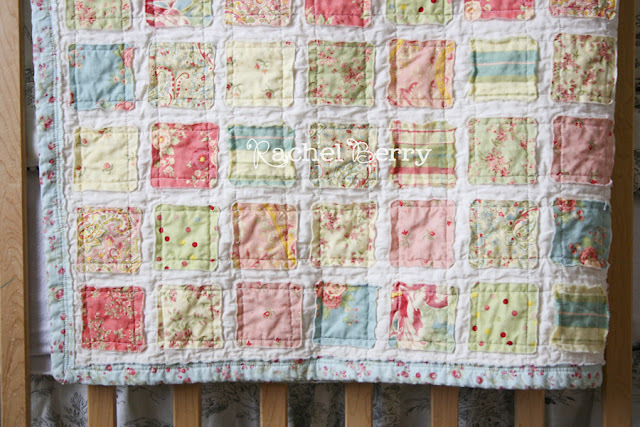 Hooray for you, the quilt is so vintagey adorable! GREAT job!! I am totally LOVIN' the quilt!! You did an awesome job!! "..only took me a couple day's working on it here and there" ??? When do you sleep? You're killin' me! Rachel that quilt is wonderful!! You did a great job. cool quilt! Thanks for sharing. ♥ Very cute. I love that it's all cut out for you that would save a ton of time! that is so cute. if we are having a little girl next (by the way I am pregnant! we get to find out what it is next month) I am seriously getting this kit and making it! I love it! Oh my gosh, you are rockin' my socks off with this one, Rachel!! I love, love, love it!! I really really want one!! I am stunned by the quilt. Oh how I would love to have one :) You are a rock star! Thanks again for the help today, it was great to chat too! That is wonderful! I also bought that kit from Quilt Taffy, and need to get it done before February as it is a gift for a friend. I'm very worried about using the fabric adhesive and all that, not used to doing things that way, so I'm crossing my fingers and hoping it works out! Wow!!!! It is breathtaking! You have created an heirloom for your girls!!! That is amazing...Rachel, can I be you when I grow up? oh and the sweet girl in the picture has seriously got to SLOW down! she's WAY to big already! What a beautiful quilt. I can't believe it only took you two days. 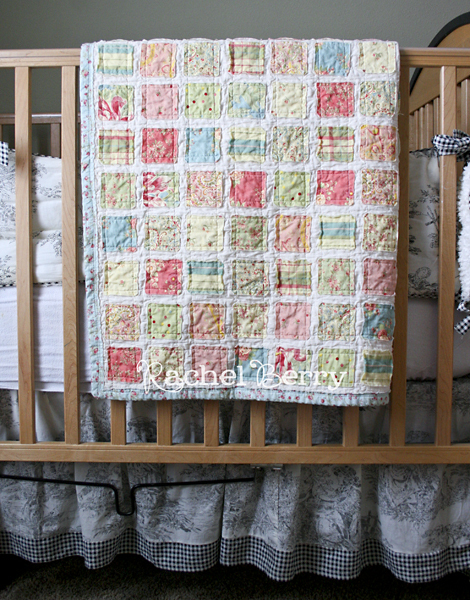 Are quilt kits that easy or are you just that good? I love your blog. Hope you don't mind if I visit once in a while. I've thought of a twin sized as well, and here is my brilliant thought. What if you did it in sections? Then when you have the sections finished you could sew them together, wrong sides facing and you would maybe have cute raggy seams going in a grid around your sections???? make sense?? Just a thought. Your pictures are great! Oh your quilt is adorable!! Great job. I totally understand how much effort goes into something like this. Congrats on finishing a great project! It's beautiful, just beautiful!!!! I love it! Awesome! That is such a cute pattern! I agree with you. That would be a lot of fabric to wrestle with. What type of machine do you have? Rachel, I'm simply amazed by you! That is about the cutest thing I've ever seen!!! Darling...and that sweet little babe standing in front of the quilt is also darling. I love it! I want to make one now! It's beautiful. You are so talented. I LOVE IT. OH MY GOOOOOOODNEEEESSSSSSS!!!! I LOVE that quilt! I am SUCH a blanket hoarder. I have to get over to the kit place RIGHT NOW! You did an awesome job! This quilt is soooooo cute! Oh I just love it. remember my baby is coming soon!!! j/k LOVE IT! WOW....I love it! I wish I could sew..I bought a machine and it is just sitting till I get a chance to play with it. Thanks for alsways sharing all your creftiness! Addison is just so adorable! I can't believe how fast she has grown in the last few months. I came here in August and geeze time flies by to quick! Adorable! the quilt AND Addison!! That is BEAUTIFUL! I am so jealous of people who can make quilts like that! Rachel, your quilt is absolutely amazing! I am just a-lovin' it! I LOVE it! Love all those little squares. I. LOVE. THIS. QUILT!!! I've been thinking I need to make one of those for a while now, and this just proves it. Love it, love it. Great pics! OH, SO CUTE, CUTE, CUTE!!! Wow - you amaze me!! I love it. It makes me want to sew and not many things make me crave that. Your quilt is GORGEOUS!!! I would have no clue how to even attempt to make a quilt but I really want to now!!!!! Rachel...thanks for stopping by!!!! :) I love your quilt~so adorable! I love it! 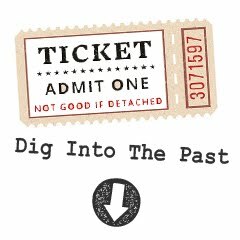 I just read your comment over at my blog....no, I'm not 55...I just had to throw people off a little...ya know just to see if people were actually reading it. He he, I'm tricky like that and I like to be REALLy silly a LOT...that's how I stay sane. Love ya girl...I'm 32 for real. You made that? My my, you have more talents that one girl should possess! jealous of your skills!!!! Oh wow, the quilt is absolutely beautiful! That is so cute..I love the fabric! Rachel, that quilt is gorgeous, I absolutely love it. I can't belive it only took you a couple of days. I'm almost finished with my Monkey, I sure hope it turns out as cute as yours. My husband said mine is scary looking, I told him that he was scary looking. Me and my little sister were talking about your blog today and how much we love it! A couple days? Are you serious? It is gorgeous! I want to do one...I'm off to check out that link now! Simply beautiful...I love the shabby chicness. I'm totally into the easy quilting! I did a twin of this last year and it is hard, but the results are so cute it's worth it! Yours looks wonderful! i am in love!!! so stinking gorgeous! it is amazing rachel! great work...and addison looks so cute too! A) I ordered this quilt (pattern) from Quilt Taffy. Thanks again! I think I got her last one. B) When I opened your page just now, my little princess G was standing next to me and said, "Oh, can we order that baby?" speaking of your little pumpkin standing next to her new quilt. Oh my~ it's amazing! I love it! The fabrics are just great and look at that smile...she loves it, too! Kuddos to you~ send me some of your creativeness girly!!! Holy cow thats a lot of comments I had to scroll through just to get to the bottom. Your soooo popular Rachel! :) I love the quilt it's way cute! And your Way Cute! I am a quilter, too. 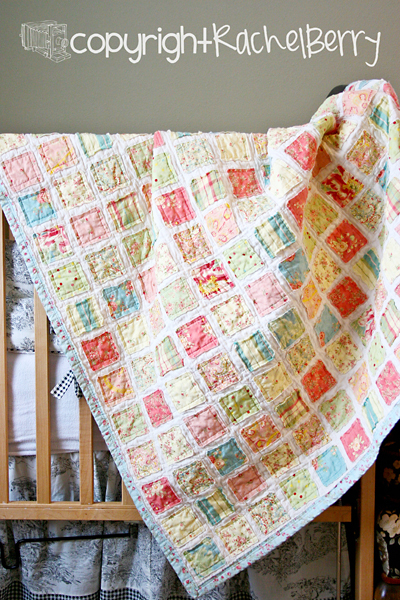 And just because of this beautiful quilt you made, I actually went and ordered the kit on ebay, too. I love how vintage it is. Thanks for the inspiration. I love seeing pictures of Addison... she has the most contagious smile! And... I love the quilt... that is beautiful! I LOVE your quilt! It's gorgeous! Can you tell me what fabric you used? The Fabric I used was from April Cornell's Poetry collection. Where do u find it online? (The Fabric) I love the quilt!!! My little girl will be coming soon. What a beautiful quilt Rachel. Where does April Cornell offer her poetry collection as fabric by the yard? Also, what's the name of the pattern, pretty please? Thanks :) I want to suprise my dil with a baby quilt for her first girl. The April Cornell fabric is no longer available, but check Etsy or eBay for Moda Jelly Rolls and you can cut the squares out of one of those! Here is a Quilt Kit with the fabric and pattern all ready to go! All you have to do is sew! I ordered the pattern! The Quilt Kits were gone, but that's ok. I couldn't find much fabric from April Cornell's poetry collection. Bah. So I'm going to go with Paris Flea Market :) Thanks for your inspiration, Rachel. I feel so good knowing I'm making something that's meaningful.